These earrings are inspired by the tale of three brothers in the Harry Potter series. It is my interpretation of the symbol from it and is made using castings of animal bones. It comes either an antique matte finish (pictures 4-8), antique polished finish or a Fully oxidised (first 3 pics) Finish. The earrings measure 1 and 3/4 inches tall and are almost twice the size of the small DH bone pendant/earrings. The earrings look big and make amazing statement earrings. Please note if you have delicate ears the smaller Deathly Hallows bone earrings may be more suitable as they have a bit of weight to them. 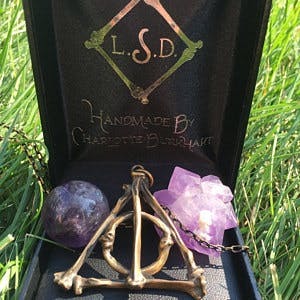 They come in either Bronze (pictured) or sterling silver (for more examples of the silver version see the Deathly Hallows Large Bone Pendant). Last photos are from @margotmeanie on Instagram! Been wanting this necklace for ages, now it's finally mine and it's even more beautiful than in the pictures! Thank you, Charlotte! This is one of the most beautiful, thoughtful, and pure artistic pieces of jewelry I've ever seen! It's insanely beautiful! I bought it for a gift for my friend and I had to buy another for me after it came in! Love love love. So much love and effort was put into it.